Nara is the earliest capitol of Japan and it is also the ancient home of the seven schools of Buddhism that were originally imported. Construction of Nara began around the 5th century ACE. Syorinzan Darumaji is a Zen Buddhist temple located just outside of the city of Takasaki in Gunma prefecture. 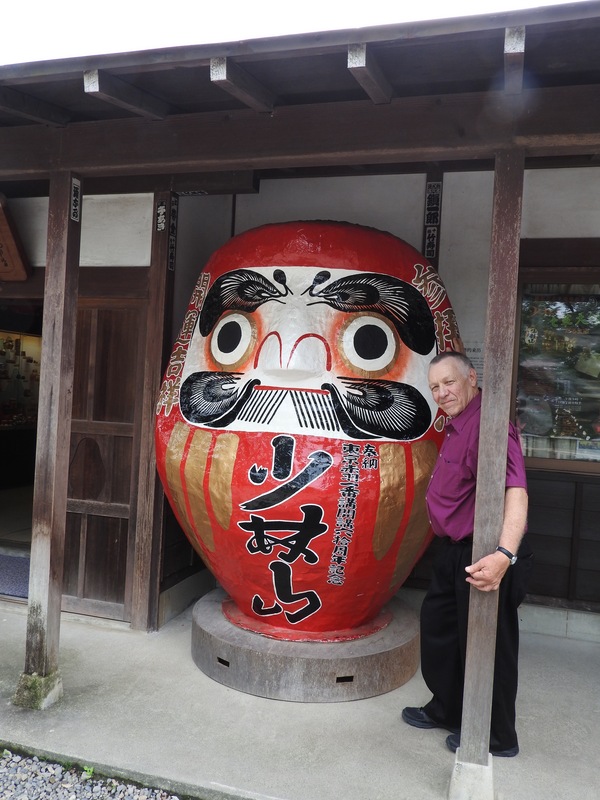 The temple derives it’s name after the Zen Partriarch, Daruma. Daruma is the Japanese pronunciation of Bhodidharma who is a renowned cultural and religious figure well known for bringing the teachings of Zen (pronounced Chan in Chinese) to China from India during the 5th or 6th century. 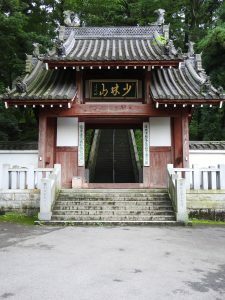 Syorinzan temple is of the Obaku denomination of Rinzai Zen. 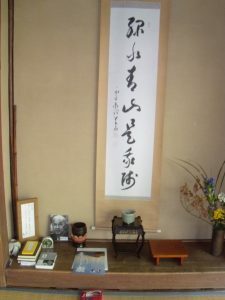 Obaku is a version of Rinzai that came several hundreds years later to Japan after Rinzai had already been established. 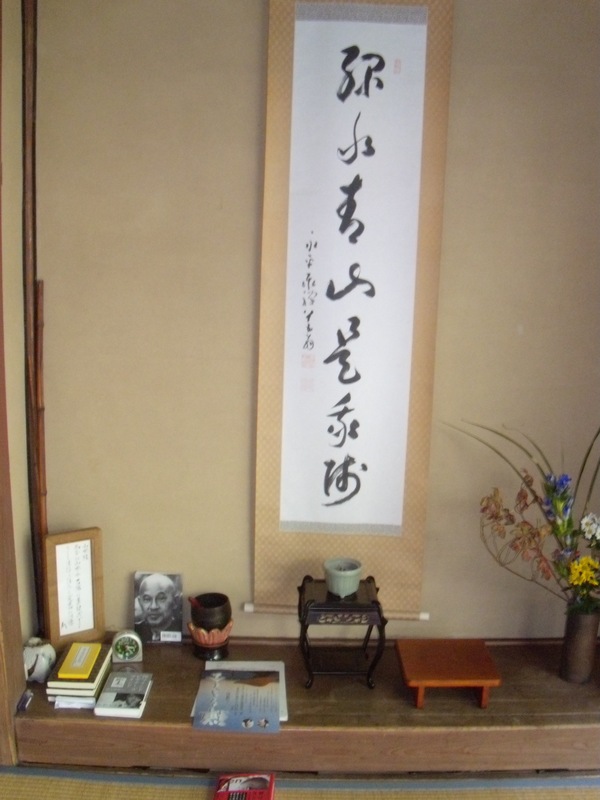 It is the 3rd largest sect of Zen in Japan though often it is considered part of the Rinzai school. Obaku has retained more of it’s Chinese heritage and customs than it’s sister school the Japanese Rinsai sect. 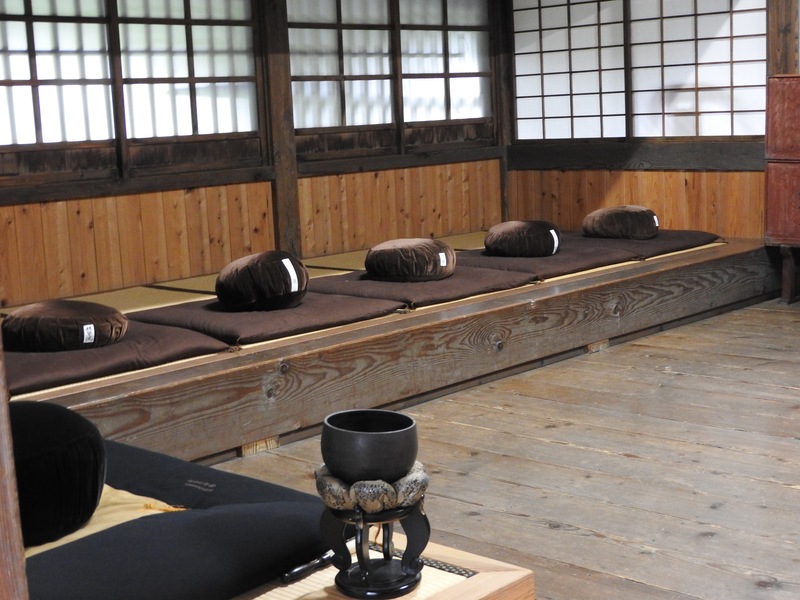 The largest sect of Zen in Japan is the Soto shu. Fuku-Daruma, better known as the daruma doll. is considered a good luck charm. During new years season it is often purchased to bring good luck during the upcoming year. 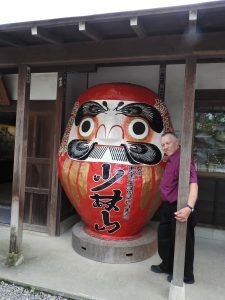 The Fuku-Daruma originated at the Syorinzan temple. The founder of this temple, Shinetsu began the custom of giving the local farmers pictures of Bodhidharma that he would paint with a single brushstroke. Several centuries later the tradition of crafting wooden images based on the brush paintings evolved. Eventually the local craftsmen started making these dolls for sale. 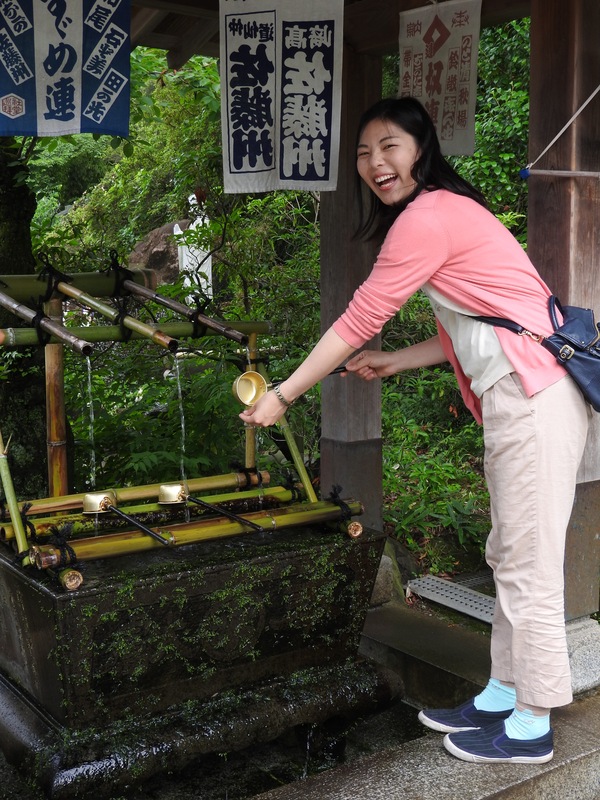 Cho zu or Water purification is an essential part of any Buddhist temple or Shinto Shrine visit. There will be a stone reservoir of cold clear water usually near the entry way. The custom is to take one of the ladles and dip it into the water first washing the left hand and then the right. Last take another ladle of water and drink from it. Now one has been cleansed of worldly impurities and you are ready to enter the temple. Rinsoin Temple is located in Yaizu city, Shizuoka Prefecture Japan and is the original home temple of Shunryu Suzuki Roshi who founded San Francisco Zen Center in 1962. 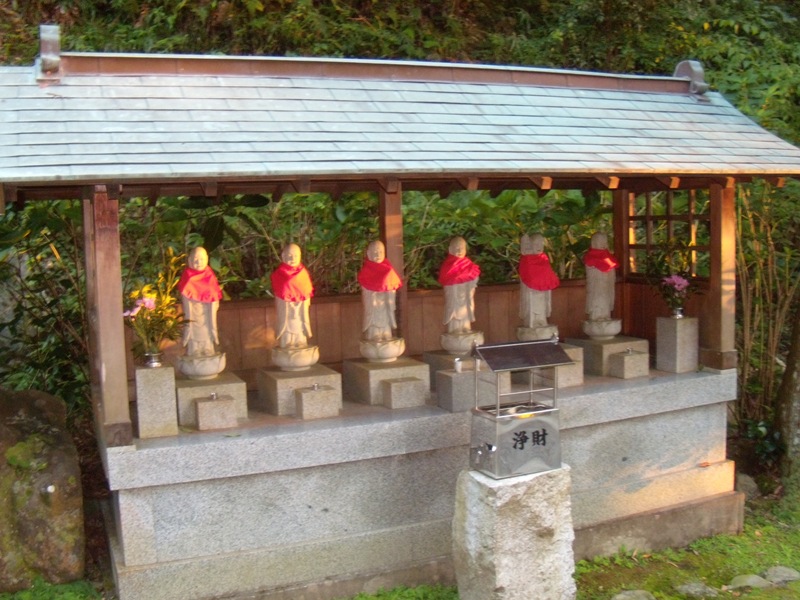 The trip from Kyoto to Rinsoin temple takes approximately 4 hours. 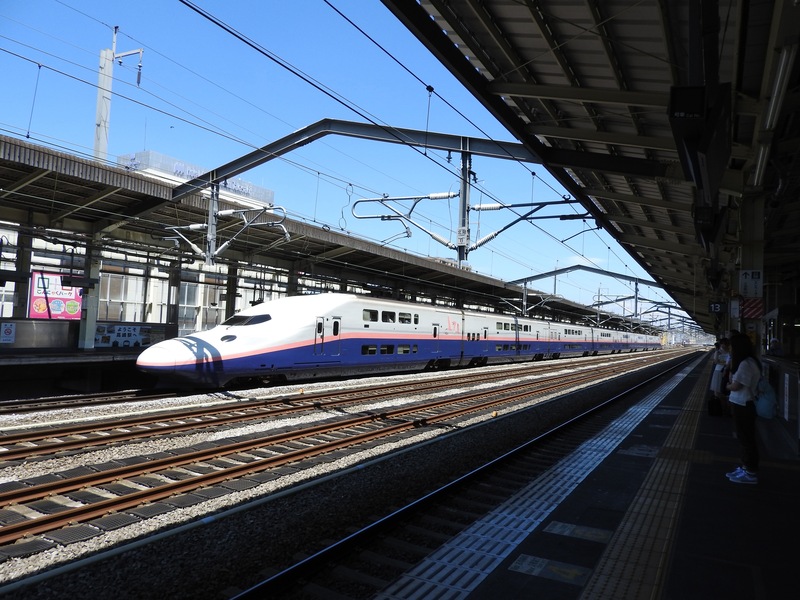 The shinkansen bound for Tokyo passes through Shizuoka city. From Shizuoka one must transfer to a local train to Yaizu. It is three stops to Yaizu and takes about 15 minutes. 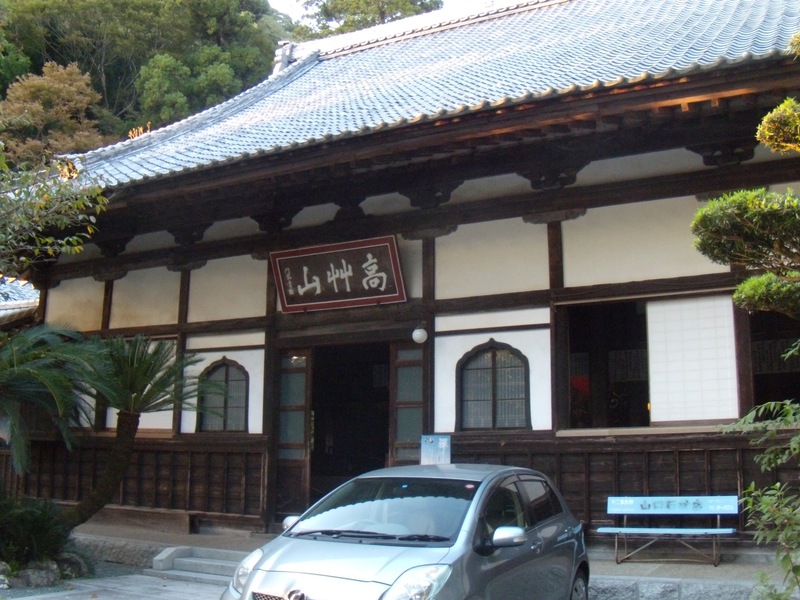 From Yaizu station it is another15 minutes by taxi up the winding road to Rinsoin. The mountain that Rinsoin is located on looms tall behind the town of Yaizu. Yaizu is a delightful rather run down small town. With the exception of the ocean nearby, it is somewhat reminiscent of mid west America. There are vibrant businesses and small restaurants and bars mixed in with abandoned buildings and overgrown areas. Yaizu is spread out length ways along the oceanfront. 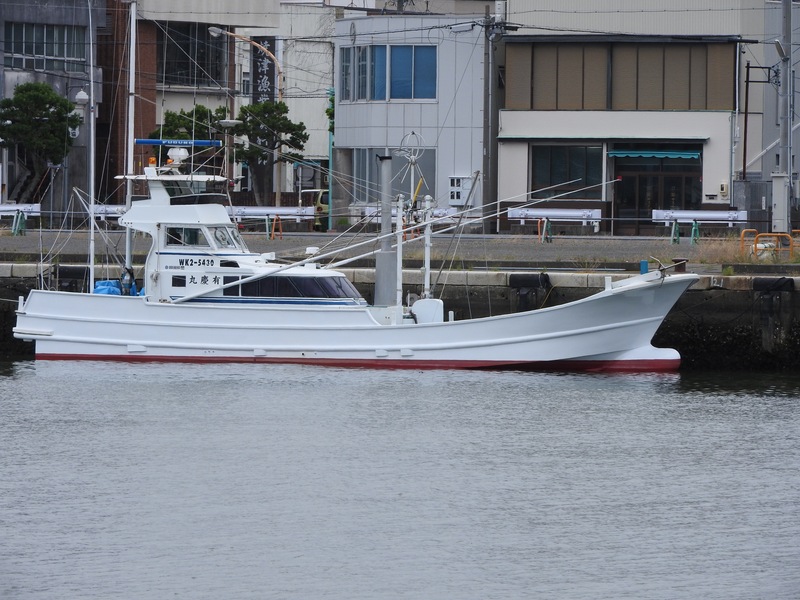 There is a working port with many ocean going fishing vessels but no tour boats visible at all. The harbor is definitely not meant to be a tourist attraction. There are no trendy expensive places overlooking the bay but rather down to earth shops and ship maintaining enterprises. 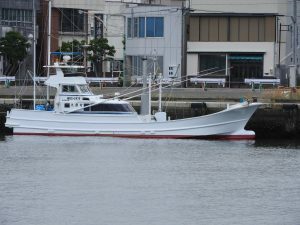 Walking along the street next to the harbor I saw this little Albacore fishing boat. These little boats go out on the open sea for days at a time. In addition to commercial fishing, the Shizuoka area is known for large scale tea agriculture. From the shinkansen one may see many fields of tea plants dotting the hillsides and valleys. 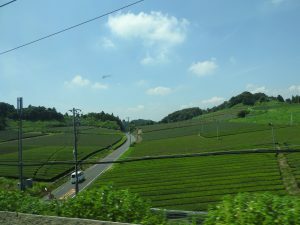 On the drive out of Yaizu one passes by smaller, more human scale fields that are planted in tea. The raw leaf of the tea plant does not taste particularly noteworthy. To transform the raw leaves into green tea it is necessary to bruise the leaves and then steam them to draw out the subtle flavors. The steam also removes the acidity from the leaves. Though black tea comes from the same tea plant it is put through a completely different process of curing. 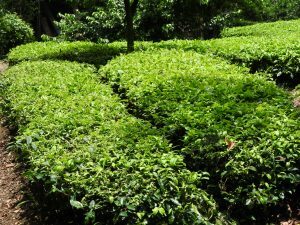 When the fresh tealeaves are harvested from the plant there are two cuttings. The primary harvesting produces the most premium tea. On the outskirts of Yaizu the narrow road begins winding up the mountain named Takai Kusa Yama or Tall Black Mountain. 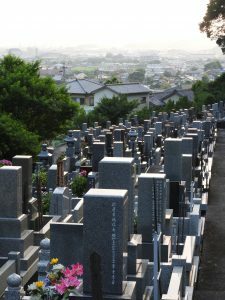 As it approaches Rinsoin, a large cemetery begins. This cemetery is well maintained and continues upwards in the valley and around the back of Rinsoin. This graveyard stretches up to where the mountain becomes so steep that it cannot go any further. 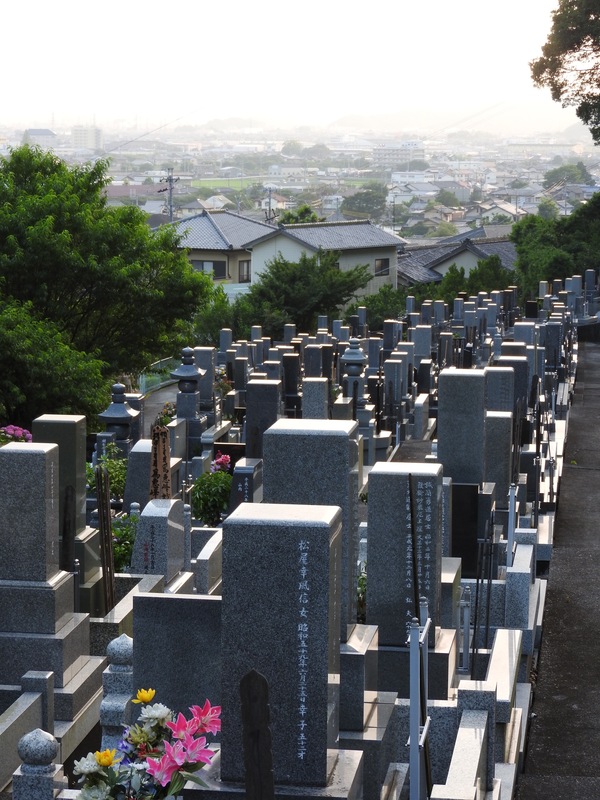 From the mountain heights above the cemetery there is a beautiful view stretching down the valley to the ocean. Along the driveway approaching the temple grounds are many clusters of beautiful Ajisa flowers (Japanese hydrangia) that have been planted there by Chitosi, the wife of Hoitsu Suzuki Roshi. 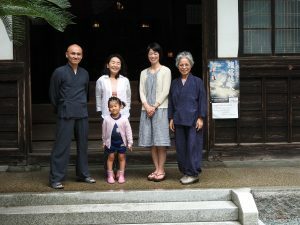 She is a master sensei of Japanese flower arranging (Ikebana) and she has several long-term Ikebana students in Yaizu. She creates several works a week and these beautiful arrangements adorn the entry to Rinsoin. Chitosi san is a very wise woman and she once explained to me about her duties. She said, “no mater what, a temple wife must always be with open arms” to visitors. When Shunryu Suzuki Roshi moved to America and passed control of Rinsoin to his son and Dharma heir, Hoitsu was only 25 years old and his wife Chitosi was a mere 20. By tradition this is an exceedingly young age for a priest to be entrusted with the management and responsibility of a temple. Usually a priest must be 50 years of age before accepting the responsibility for running a temple, especially a temple so large as Rinsoin. Rinosin was once a Tendai temple before changing to Soto-shu. 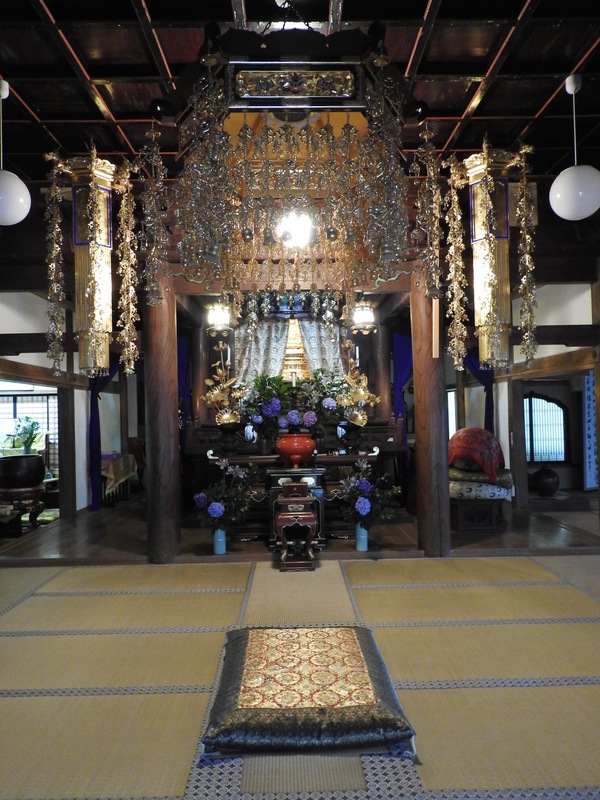 Rinsoin is such a large temple complex that there are old buildings that are seldom used. Below is the small altar in the guest quarters. 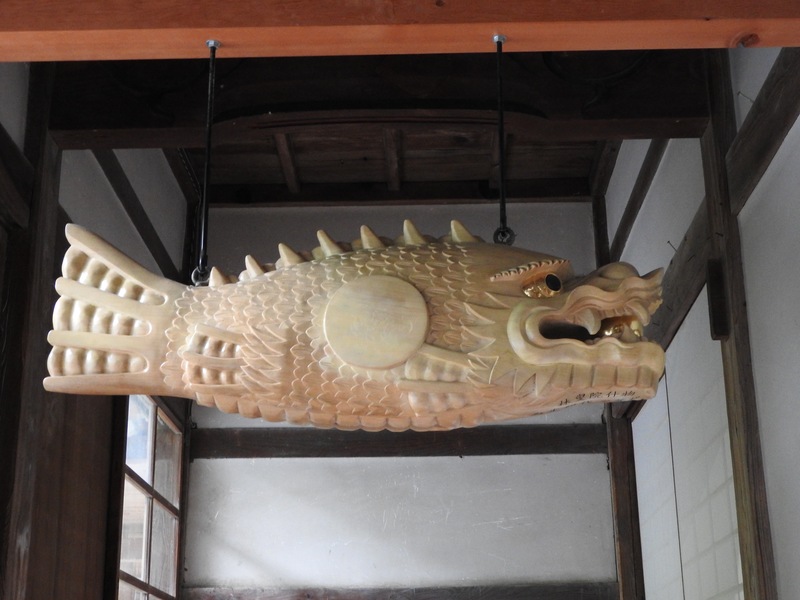 Wooden fish outside the Sodo (Zendo) hall which is struck with a wooden mallet to signal time for Zazen . There are 14 seats in the Sodo hall. 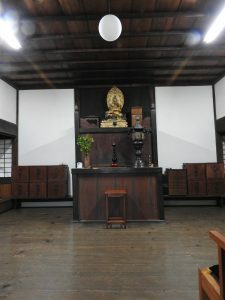 Main altar in the Butsuden. The hall can seat several hundred people. From left to right, Sungo, Marumi, Kumi and Chitosi in front is Chitosi’s little granddaughter. I am now here at Fukojo-ji Temple for the month of June. It is mid summer so the weather is beginning to be very hot and muggy on some days and rainy on others. One thing about the weather in Japan though is that it is variable and it is rarely the same two days in a row. 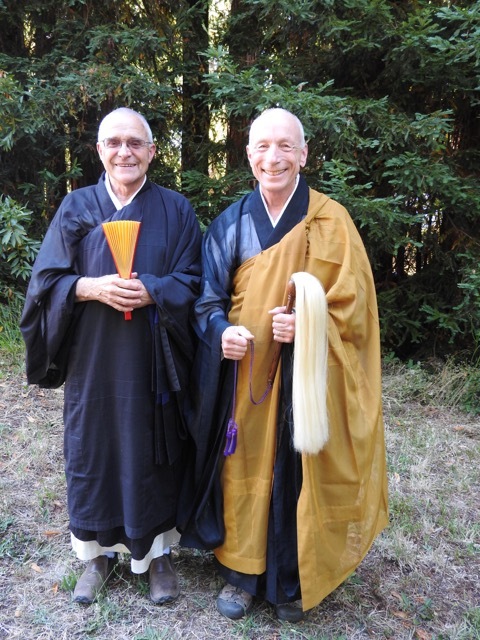 The resident priest and provisional Abbot here is Jirai Reinhardt Mehl. He always has several work projects that he wants to accomplish during my stay. We work in the mornings but in the afternoons I am usually free to pursue other interests. Jirai is gone three days out of the week working at an International Zen Training center in Fukuyama. The International center is run by a private foundation. 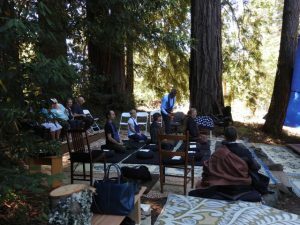 The mission of the foundation is to provide a place to allow professional people and others to experience the life of Rinzai Zen for a limited time. 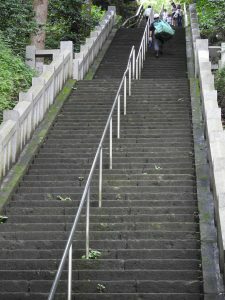 It is a place where self discipline may be practiced. 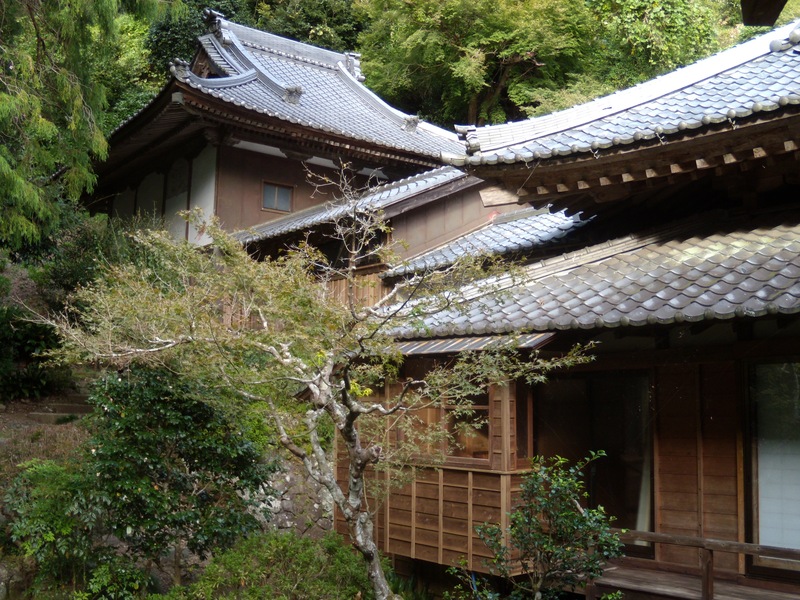 This foundation has purchased several old Temple buildings from monasteries and rebuilt them at their site near Hiroshima. Sometimes companies send employees to the International training center so that they may learn mindfulness and self motivation. 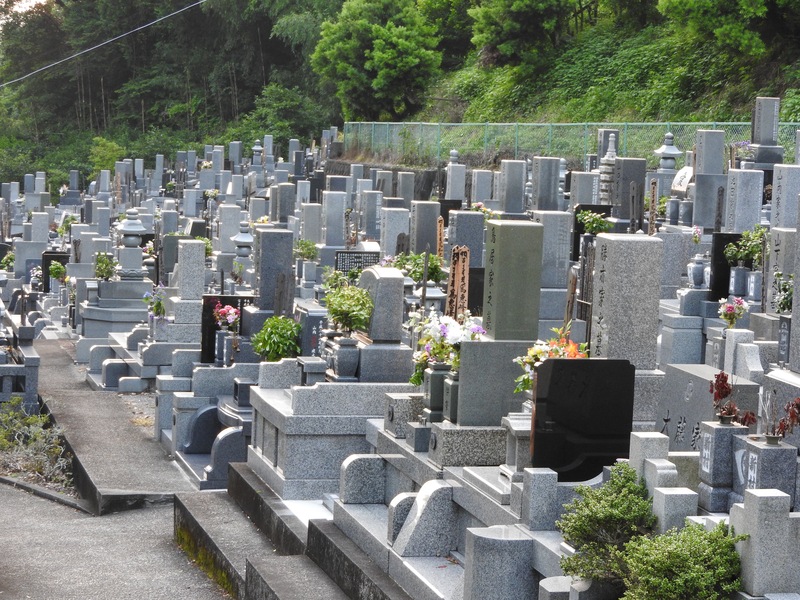 During the days when Jirai is gone my job is to caretake Fukujo-ji. My duties consist of opening the gate in the early morning and closing the gate in the evenings. Additionally, In the summer I have to open the shoji screens in the mornings and close them in the evening. I am also responsible for carrying on the tradition of doing Zazen followed by reading of the sutras in the mornings. I enjoy this time by myself and I never feel alone because I am always accompanied by the generations of Sangha that has gone before me. 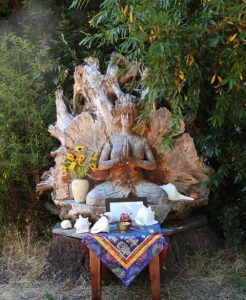 Sometimes the feeling is overwhelming that I have been entrusted with the solemn responsibility of care taking this beautiful home of the Buddha Dharma. 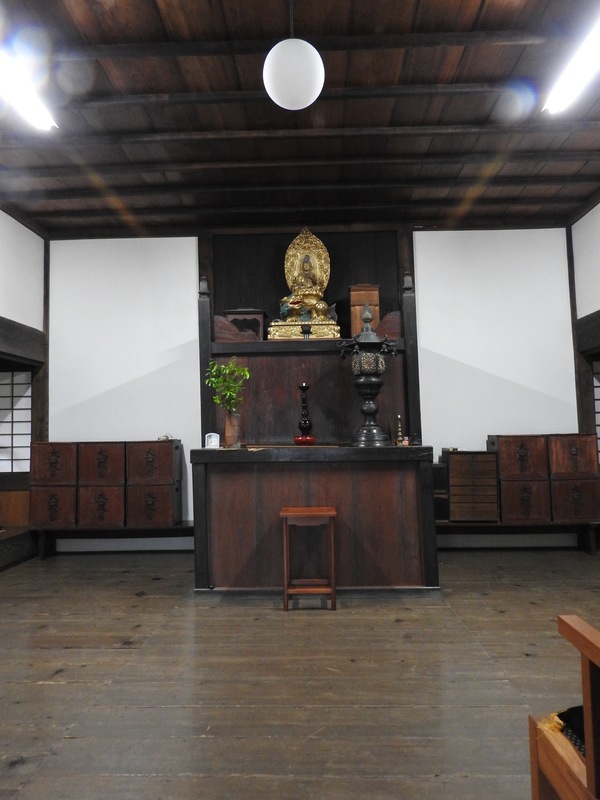 A typical day here at the temple begins with Zazen at 5 AM which goes until 6:30 AM. After Zazen there is Choka (service). 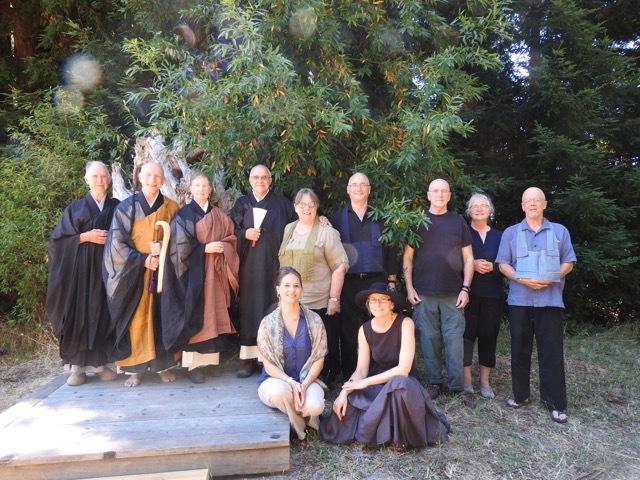 We chant the Lotus Sutra, the Heart Sutra, the Dia Shin Dhrani and the Buchinson Dhrani along with several smaller verses and echoes. The chanting takes about a half an hour and it is done very fast so I find it impossible to keep up with the tempo. Once I loose my place it is sometimes difficult to find it again. I find that I am always glad when the chanting is done. After the choka (service) is done we then prepare breakfast which always consists of Okaiyo. This traditional rice porridge is very light on the stomach but at the same time quite filling. One of the most useful things I have learned so far it how to prepare traditional Okaiyo. The direct flight on United / All Nippon Airlines from SFO to Osaka was enjoyable and it took only eleven and one half hours. The previous flights I have taken that went through Taipei usually took about 16 hours flying time. Because the trip seemed much shorter, I was not so tired when I arrived at KIX (Kansai International Airport). As I was walking through the airport looking for my taxi service a news crew from a local television station accosted me. I don’t know why they chose me but they wanted to interview me as to why I came to Japan. I was obliging and I told them that I came here because I love Japan. That wasn’t enough though and they presented endless questions so finally I had to excuse myself from them in order to locate my prearranged taxi service. I did not want to get distracted and miss my ride to Katsura talking to a news crew. 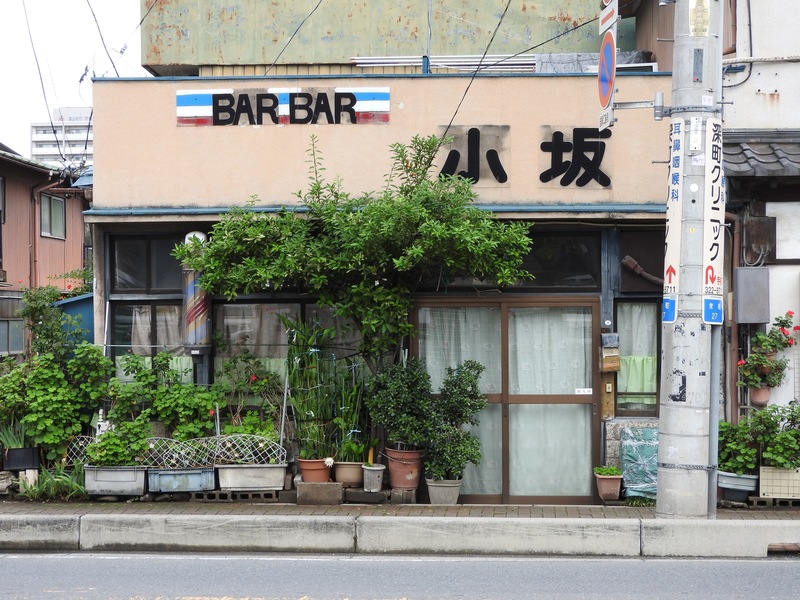 Katsura is a western suburb of Kyoto. This small town is located along the Katsura River. The hurried and noisy atmosphere of Kyoto dissipates here giving way to quiet and more tranquil rhythms. During the Heian period members of the court found this area an elegant location for viewing the full moon and that tradition still persists today in certain places outside of town particularly near certain lakes and ponds that the reflect the moon. The Katsura tree predominates the landscape and in fall the leaves turn from green to beautiful autumn shades. 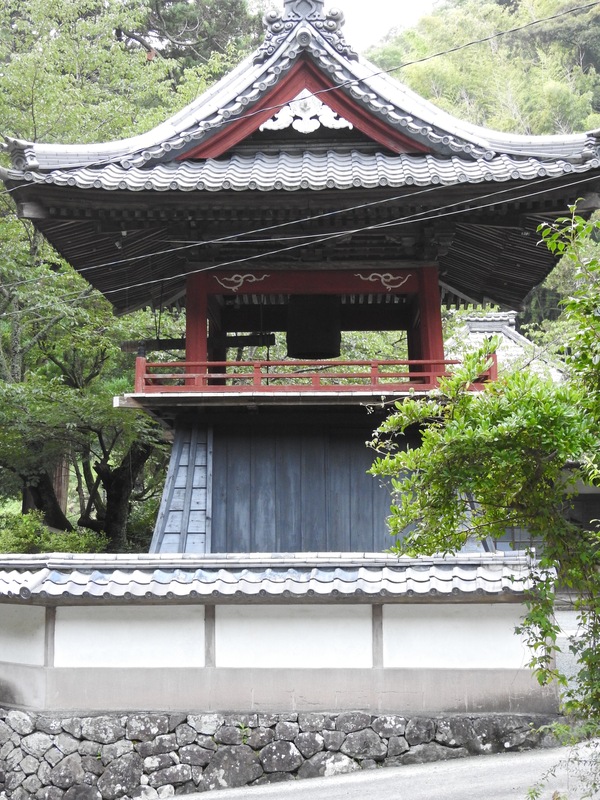 Arishiyama is a district of Katsura that is well known for it’s temples and tourism. Arishiyama in Japanese means stone mountain. In the autumn the orange coloring of the Katsura trees cover it. 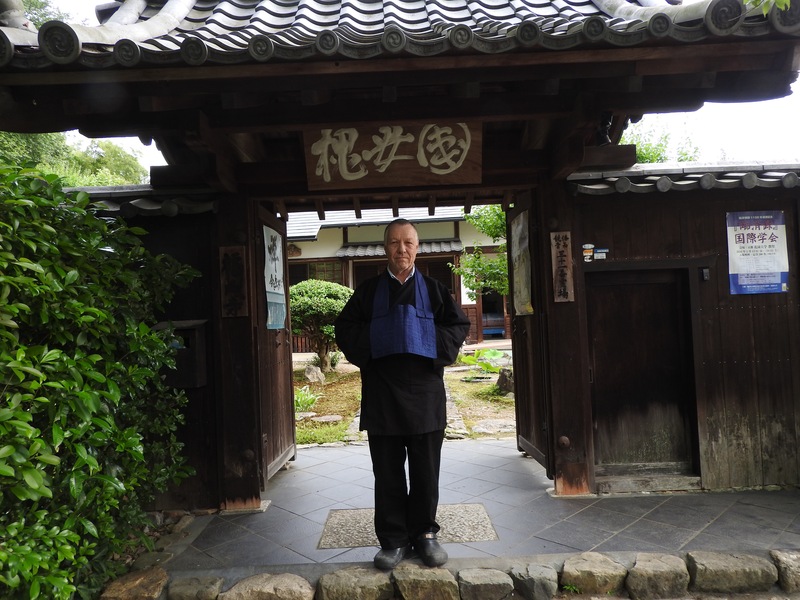 My final destination, Fukujo-ji temple is a small neighborhood Rinzai temple that is 1325 years old. 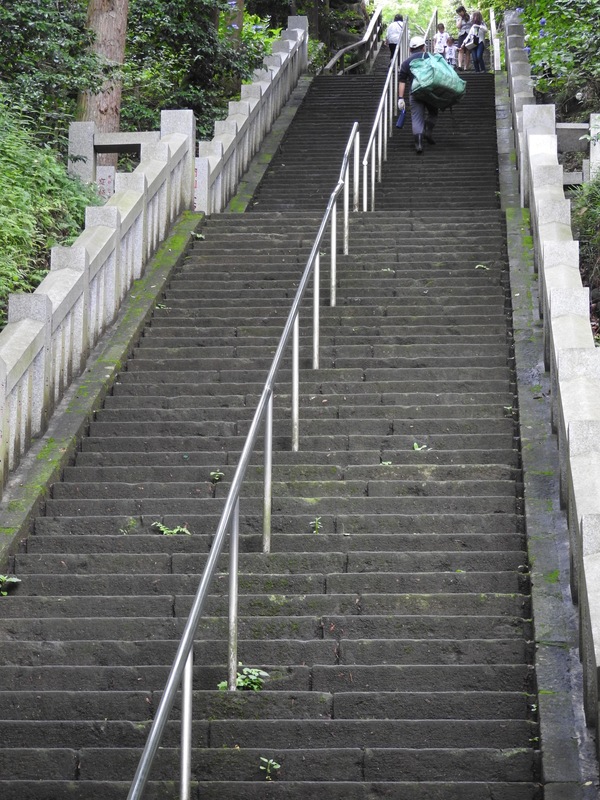 It is located high up in the hills of Katsura adjacent to a thick bamboo forest. By coincidence I came to this temple on my last trip to Japan to attend the funeral of a friend that I had known from the 70’s at San Francisco Zen Center, Mike / Shunko Jamvold. 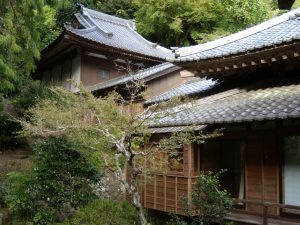 When I subsequently came back to attend a Zazenkai on a Sunday I was invited to stay here in the guest house. The priest is an ex-pat from Germany who is fluent in both Japanese and English and of course, German. 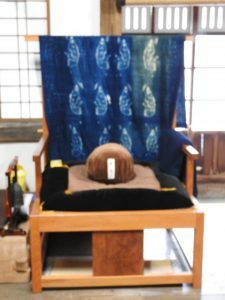 He trained at a Rinzai monastery for 3 years intensively beginning at the age of 50 which is considered old for the strenuous training. He told me that originally he had no intention of becoming a temple priest however his master (teacher) decided to turn the temple over to him after he was asked to become the head monk at a training monastery. I was very fortunate to be invited to stay here and so I couldn’t let the opportunity go by without accepting. 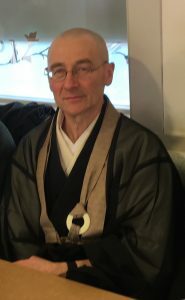 I have come come all the way from Northern California in order to stay here for 6 weeks this summer to experience the authentic temple life in Japan and learn a little about Rinsai Zen. I am finding that I will also learn a lot about myself in the process. 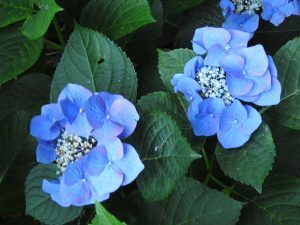 I can barely stand the climate of Kyoto in the summer, it is so hot when the sun is out. It is always a relief when it rains for a day or so but after the rain when the sun comes out again there are suddenly so many mosquitos everywhere. Kyoto is really hot in the summer and I had not realized how intense the change would be to go from the rather cool Northern California climate directly to the heat of Kansai prefecture during the height of summer. It took me about 2 weeks to adjust to the heat. The little grocery store right down the street from the temple is usually very busy late in the afternoons when people are heading home. It is a good time to interact with the Japanese working class up close and first hand. Of course you have to observe without it being noticed that you are observing. As one of my senseis used to say Nihongo is all about ambiguity. I find Japan to be a place of unbounded esthetics and endless inspiration. 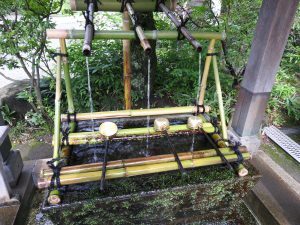 The confluence of Shinto, Buddhism and the history of the Samurai form a culture that is steeped in honor for self and other, reverence for nature and respect for tradition. 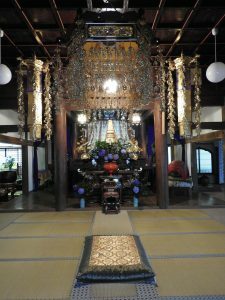 I hope you’re inspired by these images and essays of temples and shrines of Japan and moved by them to a better understanding of this deep and beautiful culture. I visited Byodoin temple in February of 2016 with the class from Kyoto Minsai Japanese Language school. The PDF here uses my own photos as well as others that are properly credited to their particular source. 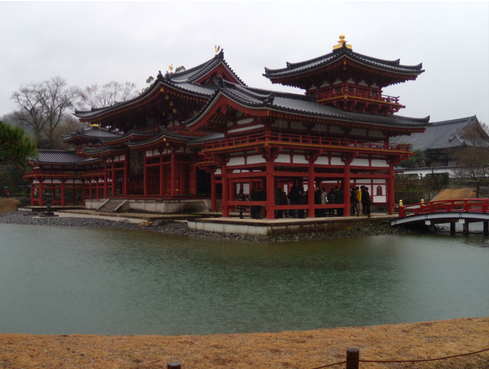 Kiyomizu-dera temple is one of Kyoto’s most famous Buddhist temples. It is located in the eastern hills overlooking the city. 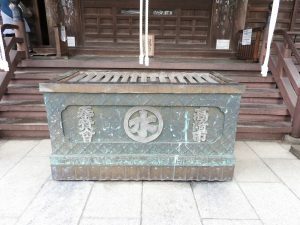 For many centuries, it was affiliated with the Hosso sect, which in English means “Mind Only.” The Mind Only sect is one of the seven schools of ancient Buddhism that came to Japan towards the end of the 7th century during in Nara period. The temple was founded in approximately 780 CE and presently it is designated as a UNESCO world cultural heritage site. In January of 2016 I visited there and created the photographs that make up the photo essay on this enchanting place. 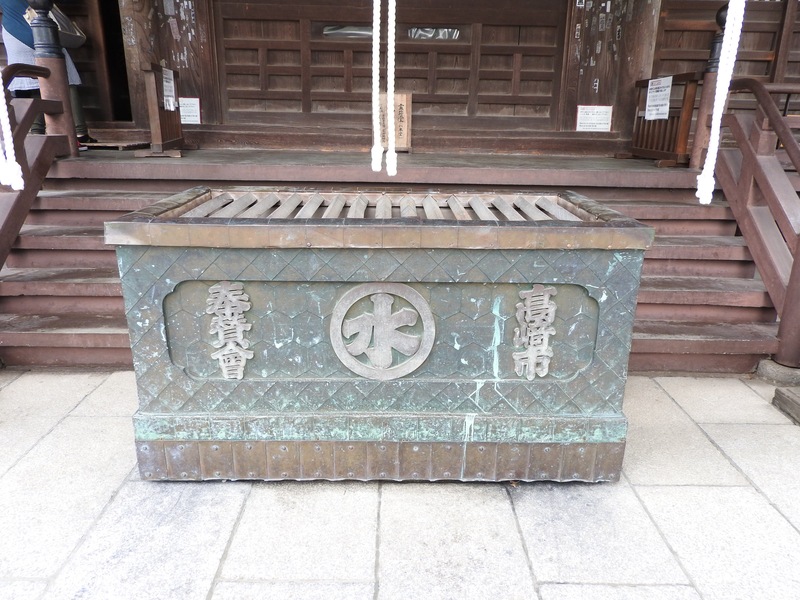 It is displayed under the Buddhist temples heading. I hope you enjoy the photo essay.